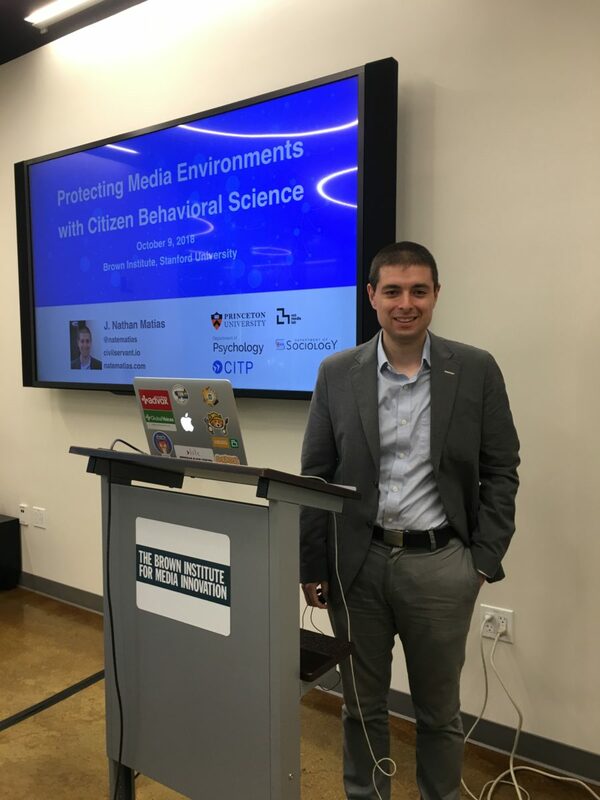 J. Nathan Matias, associate research scholar at Princeton University in psychology, the Center for Information Technology Policy, and sociology, also is the founder of CivilServant, a nonprofit that organizes citizen behavioral science and behavioral consumer protection research for the internet. In this talk, Matias discusses how CivilServant has worked with communities of tens of millions of people on Reddit and Twitter to test ideas for preventing harassment, broadening gender diversity on social media, respond to human/algorithmic misinformation, manage political conflict, and audit social technologies. He also analyzes how to protect media environments and draw parallels between history of our current moment and the history of environmental protection and food safety, pointing out the key role of citizen science. In 2017, Nathan completed his Ph.D. at the MIT Media Lab with Ethan Zuckerman. His writings have appeared in The Atlantic, PBS, the Guardian, and other international media.